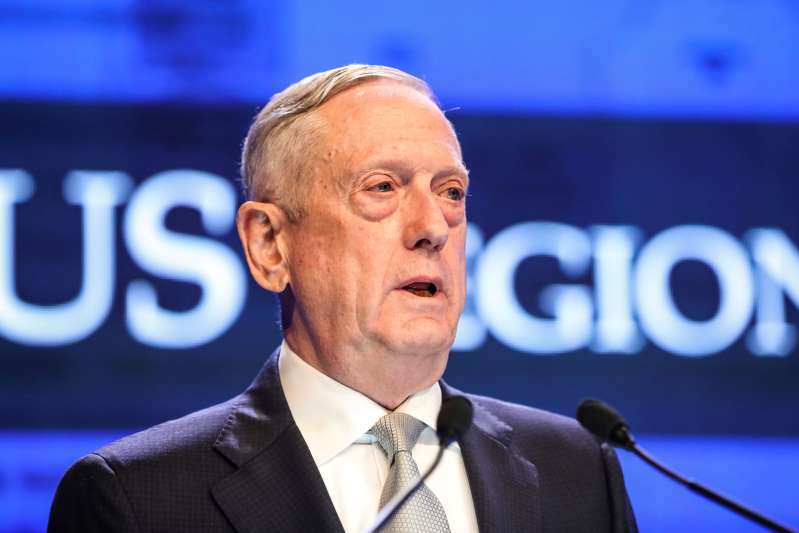 U.S. Defense Secretary Jim Mattis on Saturday raised the prospect of additional American steps against China if its "militarization" of the South China Sea keeps apace. He said Beijing was intimidating and coercing others in the region by putting weapons systems on manmade islands. President Donald Trump, backing the remarks by his Pentagon chief at an international security forum in Singapore, said on Twitter: "Very surprised that China would be doing this?" Mattis said the Trump administration's recent decision to disinvite China from a multinational naval exercise this summer was an "initial response" to Beijing's island activity. Mattis called the U.S. action a "relatively small consequence. I believe there are much larger consequences in the future." China's reliance on military muscle to achieve its goals "is not a way to make long-term collaboration the rule of the road in a region that's important to China's future," Mattis said, when asked to elaborate. "There are consequences that will continue to come home to roost, so to speak, with China, if they don't find a way to work more collaboratively with all of the nations who have interests," he said. The bluster comes at a delicate time in U.S.-China relations, as the Trump administration is warily asking for China's help with North Korea ahead of a June 12 summit, while also threatening a trade war. Trump renewed his threat to hike tariffs on Chinese goods, just days before his commerce secretary's arrived in Beijing on Saturday for trade talks. Mattis said there was little doubt about Beijing's intentions. "Despite China's claims to the contrary, the placement of these weapons systems is tied directly to military use for the purposes of intimidation and coercion," Mattis said at the annual Shangri-La Dialogue. Mattis also touched on Taiwan, a longstanding dispute between the U.S. and China. He said Washington will continue to provide defense equipment and services to Taiwan and oppose any effort to alter the status quo. China claims the self-governing island as its own territory to be brought under its control by force, if necessary. But he also said the U.S. welcomes cooperation with China "wherever possible," and announced that he has accepted Beijing's invitation to visit soon. It was not immediately clear whether that invitation would stand after the conference. Mattis' comments drew a pointed reaction from a Chinese official at the meeting. Senior Col. Zhao Xiaozhuo said a U.S. move to send two warships into China's "territorial waters" was a violation of law, and an "obvious provocation to China's national security and territorial integrity." Two U.S. warships sailed close to the Paracel Islands on May 27 in the latest freedom of navigation operation designed to challenge Beijing's claims. China protested the maneuver. The previous week the U.S. had withdrawn an invitation for Beijing to participate in the exercise known as Rim of the Pacific. The Pentagon said the decision to disinvite the Chinese Navy was triggered by what it called strong evidence that China has deployed weapons systems on the islands. China says it is within its rights to build up defenses on islands in the South China Sea that it believes are its sovereign territory. The Pentagon chief gave only a brief mention of the negotiations for the planned June 12 summit in Singapore between Trump and North Korean leader Kim Jong Un. Trump announced Friday that the meeting was back on. Mattis said the Pentagon will "hold the line" and support the diplomatic effort to secure the "complete, verifiable and irreversible denuclearization of the Korean Peninsula."